These oil free compressors are perfect for spray guns and applications, much as medical environments, where it's important that oil doesn't pass through a tool. These oil-less compressors are also low maintenance and incredibly easy to set up and use. If you do a lot of your own DIY, or work in a workshop or garage with power tools, then you’re sure to know how important having an oil-less air compressor is. View our Air Compressor Selection Guide for help choosing a compressor. 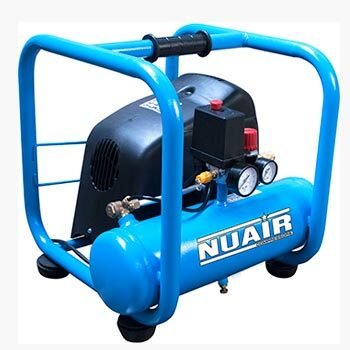 Air compressors in general release powerful bursts of air which then power certain pneumatic tools used for pumping up tyres or powering spray guns. Tools they are usually used for powering include sandblasters, nail guns, air staplers and blow guns. Using an oil free air compressor has a lot of benefits as it ensures an oil free air supply which is much cleaner economically with less contamination. Oil contamination can often cause some tools to stop working properly or result in a poor finish when painting for example. Often an orange peel effect can be noticed on a paint job when an oil-less air compressor has not been used, so it’s always best to use a no oil air compressor when you need a premium smooth finish. 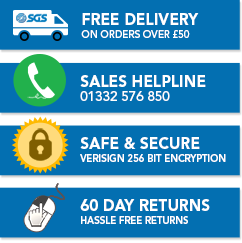 At SGS our oil-less air compressors for sale provide a top quality, efficient power supply and are much small and lighter than their oil using counterparts. Air compressors are great for a wide range of work tasks, such as: drilling, hammering, sanding, grinding, cutting, nailing, stapling, wrenching and more. We've put together a few how-to guides and some safety information to get you started with your air compressor.